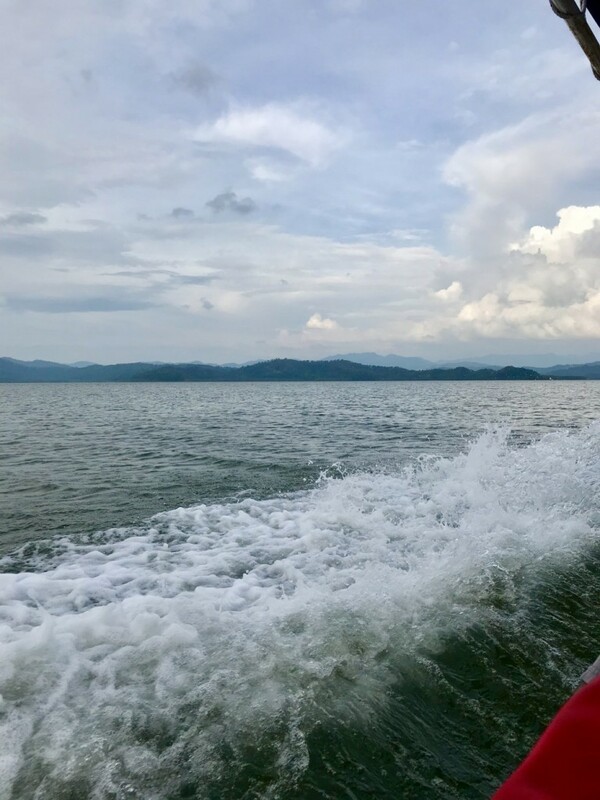 We booked ourselves for the half-day Sambah River Cruise tour which starts from the Kampung Bunga, Tenghilan jetty, about 40 minutes drive from Kota Kinabalu. 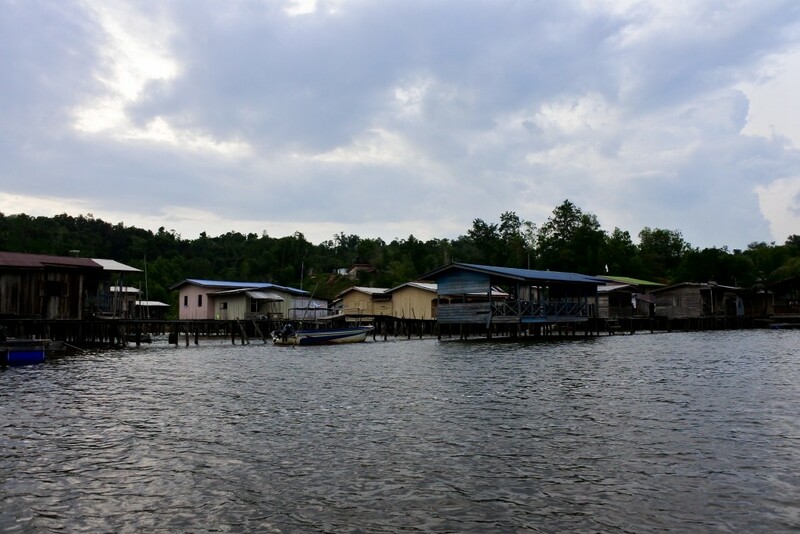 We had to drive through a local village to get to the jetty giving us a glimpse of what to expect during the tour. We arrived at a huge parking space and a small jetty with some seating space while we waited for the tour to start. In the next few hours, the boat will take us into secluded a water village, explore the life, sights, and sounds of rural living and witness colonies of magical fireflies twinkle in the darkness. The tour started at 430pm where we were all given life jackets before hopping into the boat. 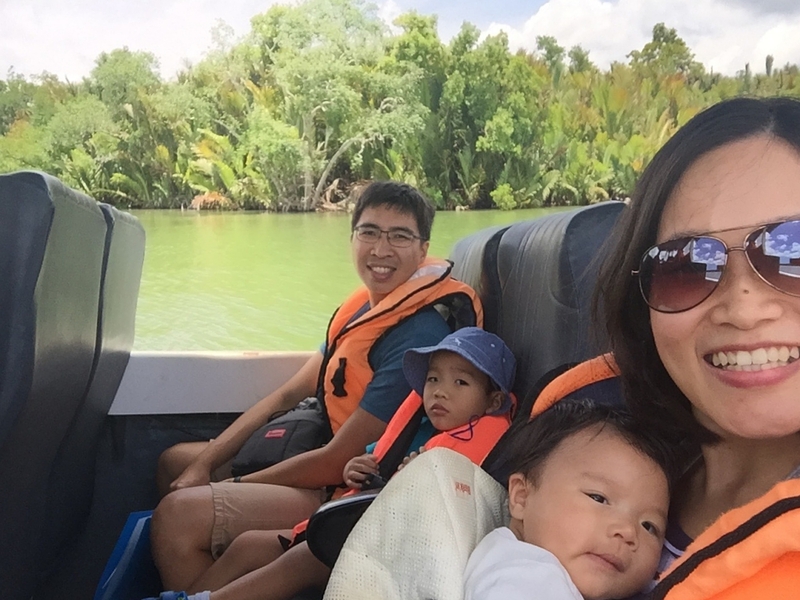 Our children, 5 and 2 years old (together with our friends and their three children) thoroughly enjoyed the boat ride with the refreshing breeze and occasional splashes into the boat. They roared with laughter every time they got a little wet! 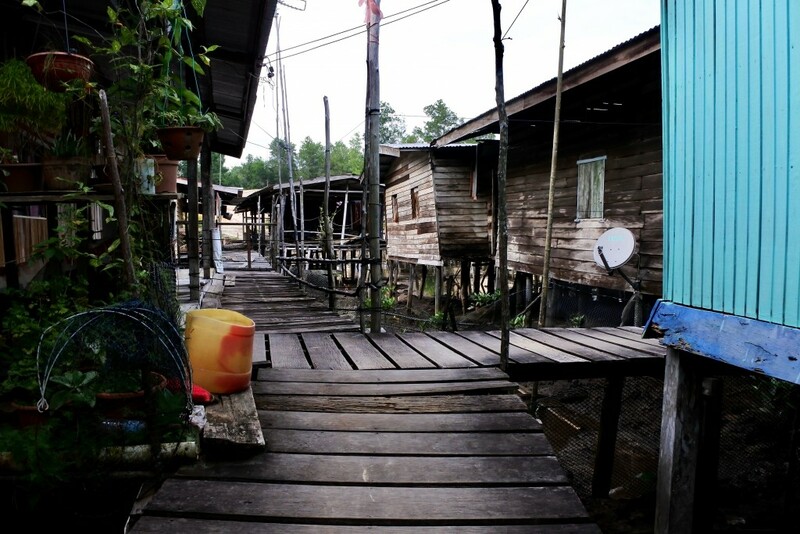 We arrived at Kampung Sambah, a water village inhabited by the Bajau community. We had a quick pit stop at the jetty for a quick bite of local traditional snacks – goreng pisang (banana fritters) and kuih pinjaram (sweet chewy cake that’s in a distinct green colour). 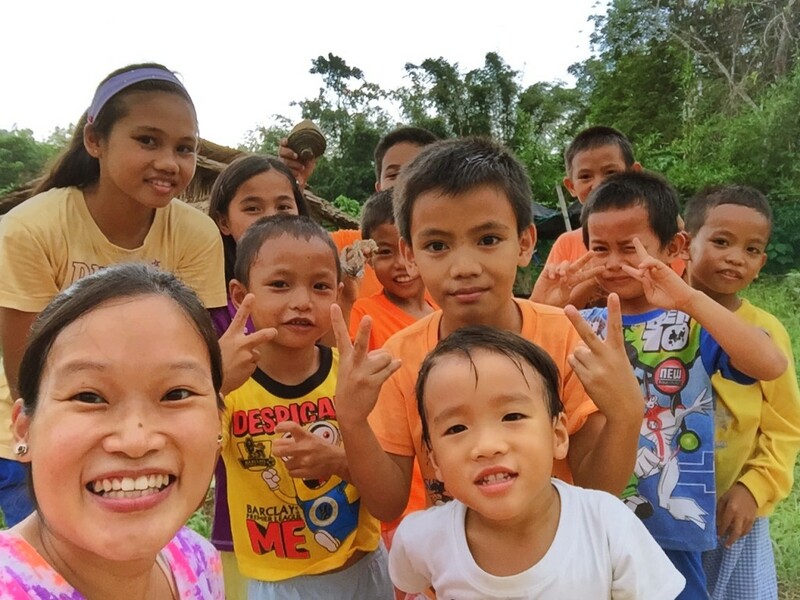 This small village of about 200 villagers has only one primary school with an amazing student to teacher ratio of 18:12. We made a beeline to Sekolah Kebangsaan Kampung Sambah after the light refreshments. 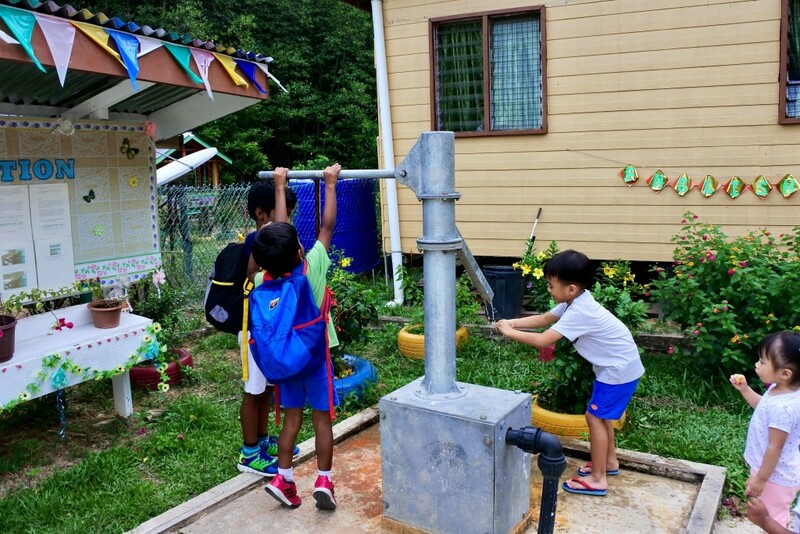 This small school has a tiny canteen, an English corner, an outdoor play area, a waste segregation shack, a manual water pump that draws water straight from the ground and beautifully decorated school grounds and classrooms. I was amazed at the upkeep of the school and was encouraged by the education opportunity children in this village were given. 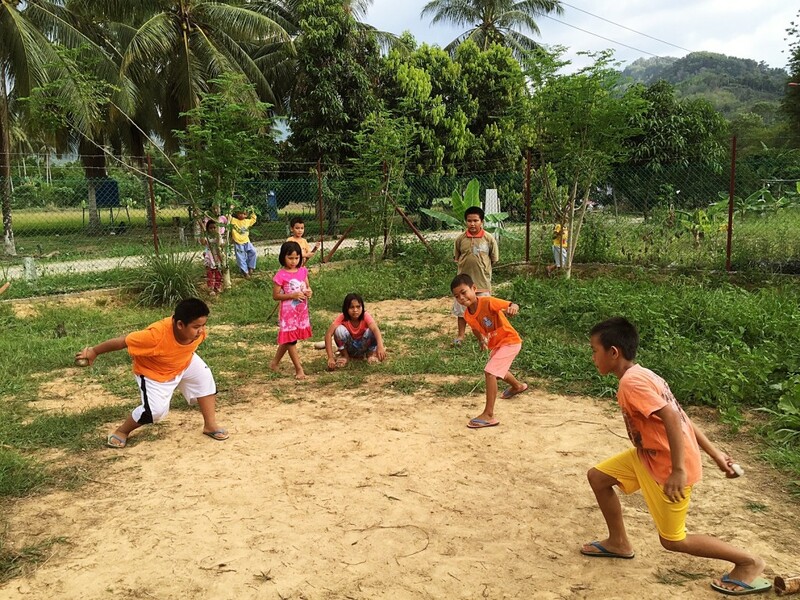 Just outside the school compound, children and youth gathered as they played in the evening cool. There were a group of boys playing football, and another group kicking the sepak takraw ball, and then there were a bunch of younger girls playing chase and cycling around. The atmosphere was one of freedom and simple joy! 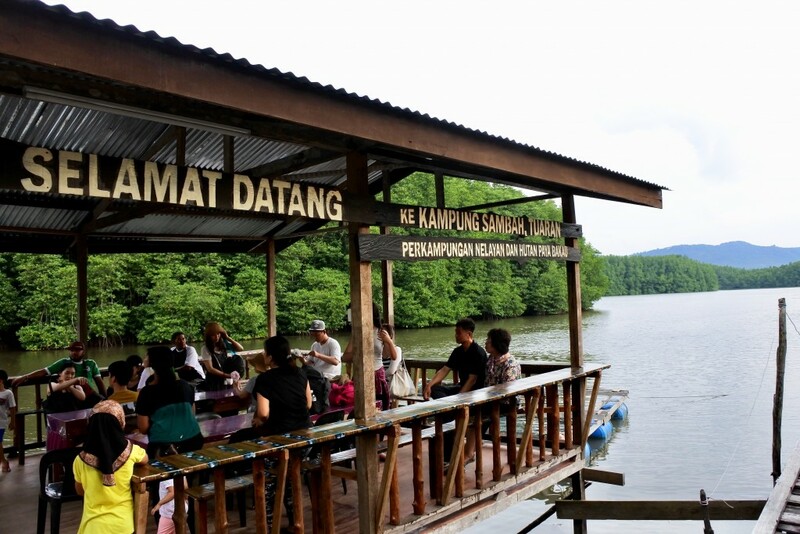 We learned that Kampung Sambah is known for udang salai – smoked prawns. 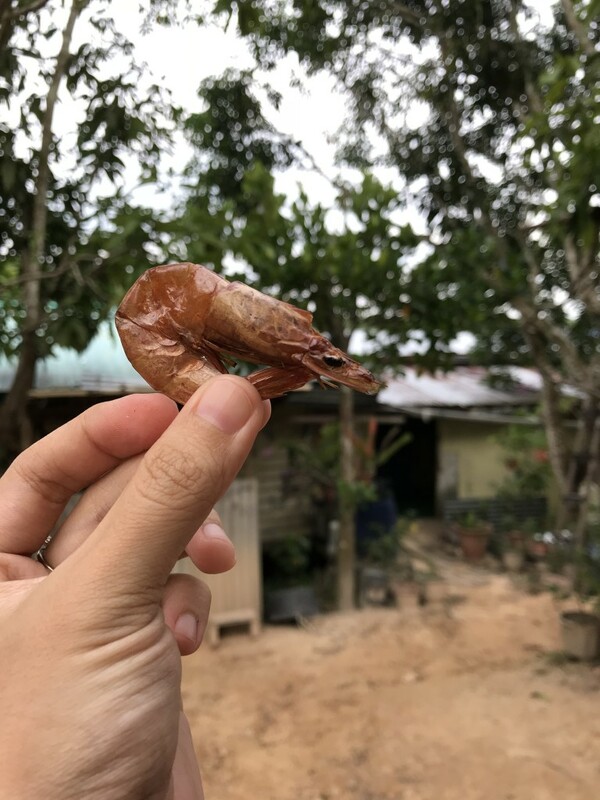 This is a local delicacy that is produced mainly in this village where river prawns are smoked for hours until they turn a nice tan brown colour. The taste is distinct and I’m sure will go very well with some sambal (chilli prawn paste) and white rice. We headed back to the jetty walking on raised wooded pathways connected to wooden houses. Children peered out from their homes offering friendly waves and bright smiles. Our tour guide pointed out to his house and beamed with pride as he continued to show us around his village. We hopped back into our boat just before sundown to a midway jetty where we stopped to have our dinner and tried our hand at fishing. We were each given a plastic ring with a nylon string twirled around it. At the end of the string is a weight and hook where a tiny piece of shrimp is attached. 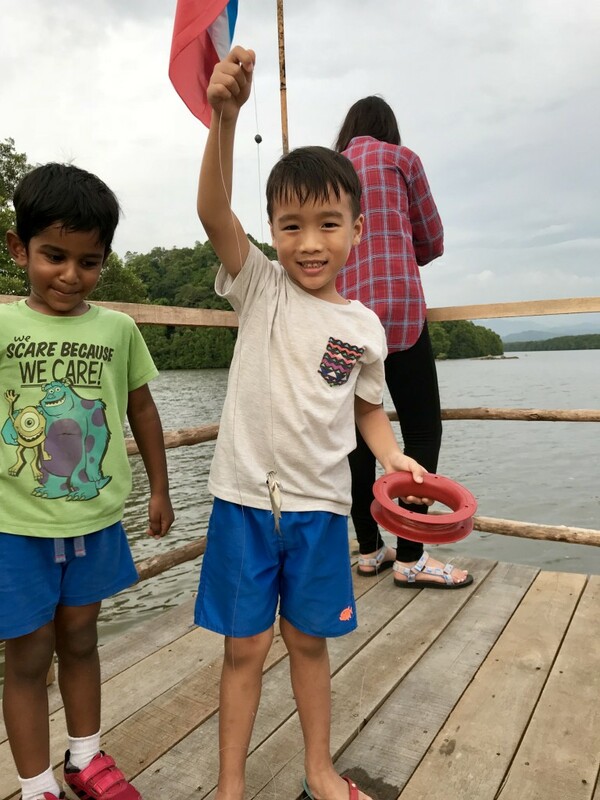 The children enjoyed uncoiling the string into the water and waiting for the gentle tug from the fish nibbling at the shrimp. My son, Seth successfully caught a tiny fish, snapped a photo of his first catch and gently released the fish back into the water. If fishing does not entice you, you can simply bask in a hammock and watch the sun come down while enjoying the gentle breeze. 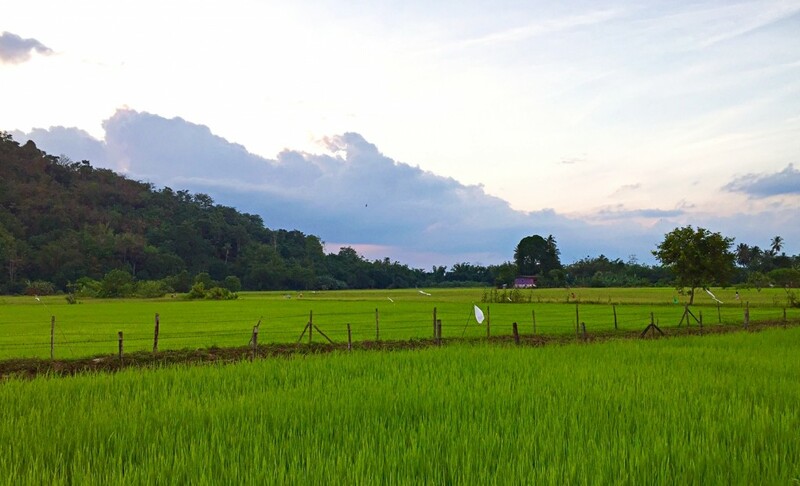 We had an early dinner around 6pm, where we helped ourselves to a simple spread of Malaysian favourites – stir-fry vegetables, spicy prawns, fried fish, fried chicken, fresh herb salad, and fruits. 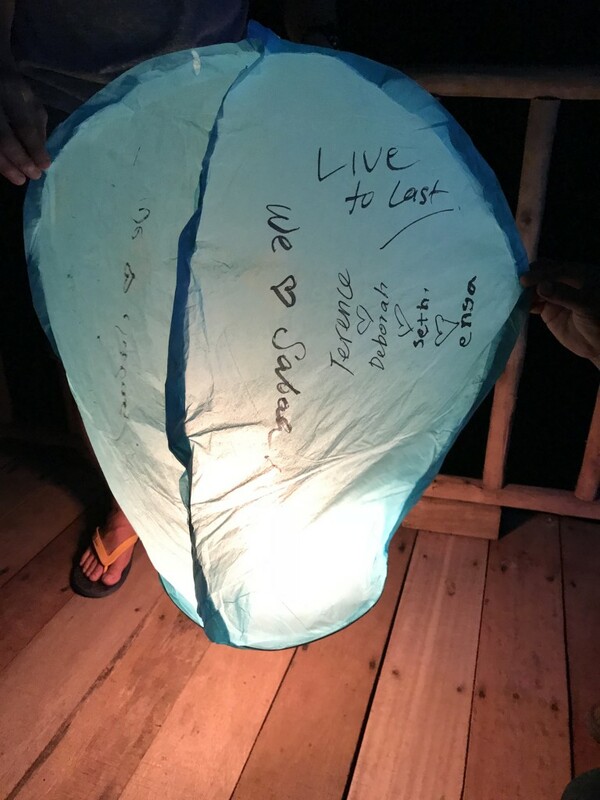 As night fell, each family was given a paper lantern and some markers. We penned some words on the delicate lantern, lit it, waited for it to expand and released it into the sky. It was such a thrill watching the lantern drift into the darkness. The magic continued into the night as we hopped back onto the boat to look for fireflies. Our guide used an LED bulb to attract the fireflies and as we neared the colony, the fireflies lit up like a Christmas tree. Fireflies produce light through a chemical reaction (a process called bioluminescence) at the lower part of the abdomen. The beetle although small is not hard to spot especially when it is pitch dark. I’ve seen fireflies in Kuala Selangor (Peninsular Malaysia) but have heard that the numbers have dropped significantly. It’s no surprise as fireflies are a good indicator of a healthy habitat – which means that if we lose natural habitats like this connected mangrove forest, our friendly fireflies will also dwindle. Let’s hope they stick around for long! Note: You will need to drive yourself to the Jetty. If you require transport from KK, there will be additional charges. 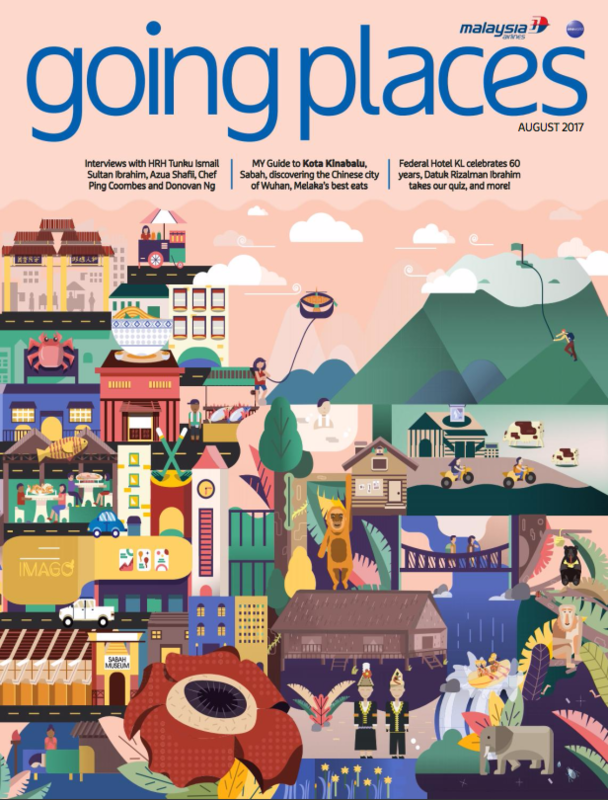 Kota Kinabalu is usually a stop over for travelers who are exploring greater Borneo, but this city is packed with culture, character and charm. 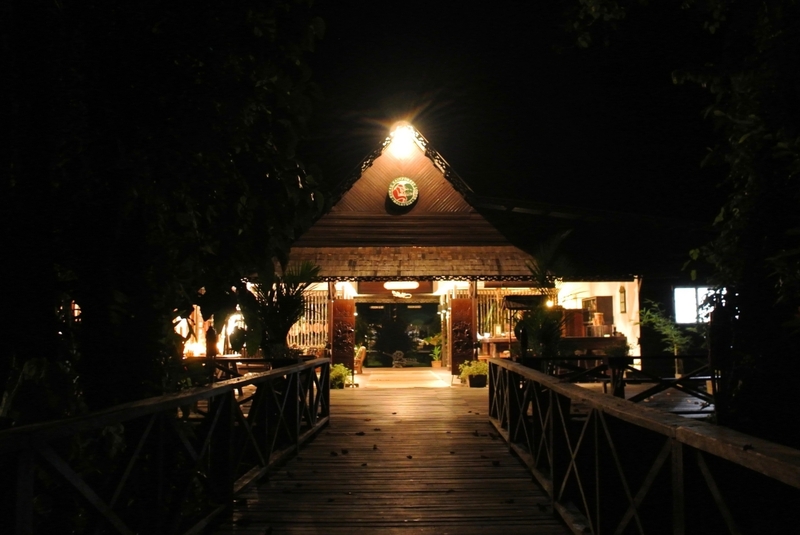 Extend your stopover to experience the unassuming beauty it has to offer. 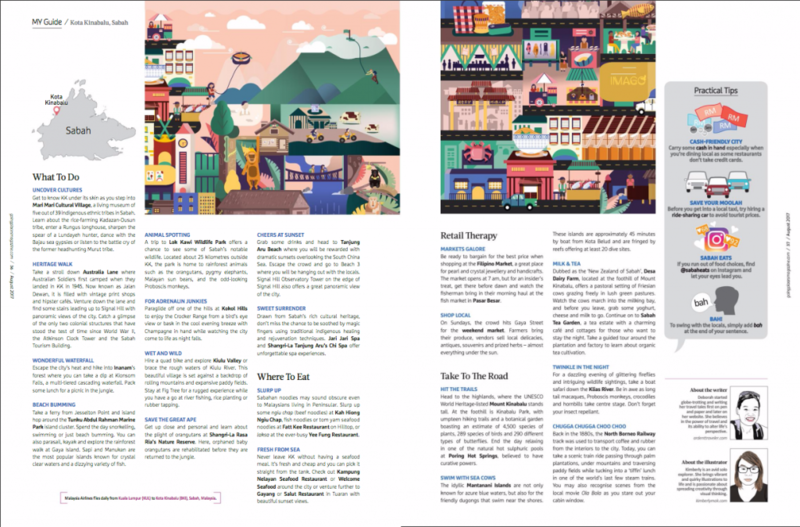 This comprehensive guide is ideal for newbies to KK and families looking for a short vacation. Note: A quick amendment to one of the points of interests at Shangri-La’s Rasa Ria Resort & Spa. 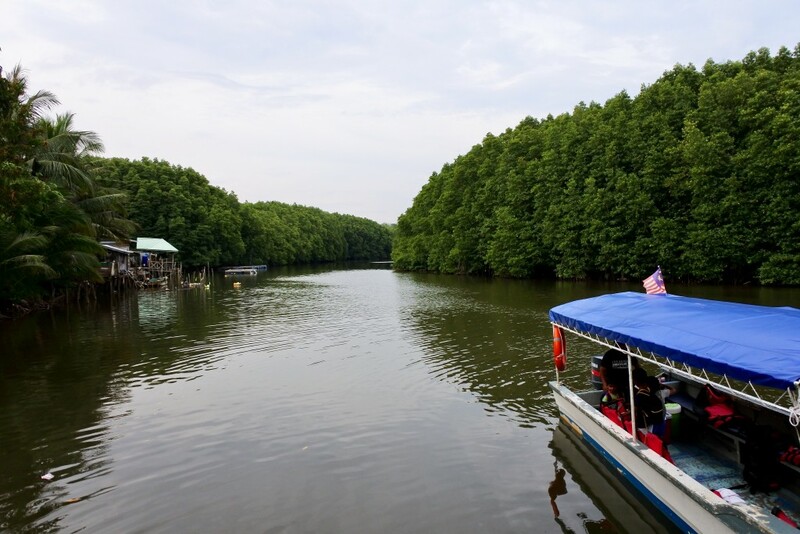 If you’re planning on catching a glimpse of the orang utans, head over to Lok Kawi Wildlife Park instead. The hotel’s Orang Utan Rehabilitation Programme has successfully come to a close and the great apes no longer roam the nature reserve. The 64-acre nature reserve, however, is still a fantastic place to explore the wild! If you’re a first-time traveler to beautiful Borneo, this is your quintessential tropical island. 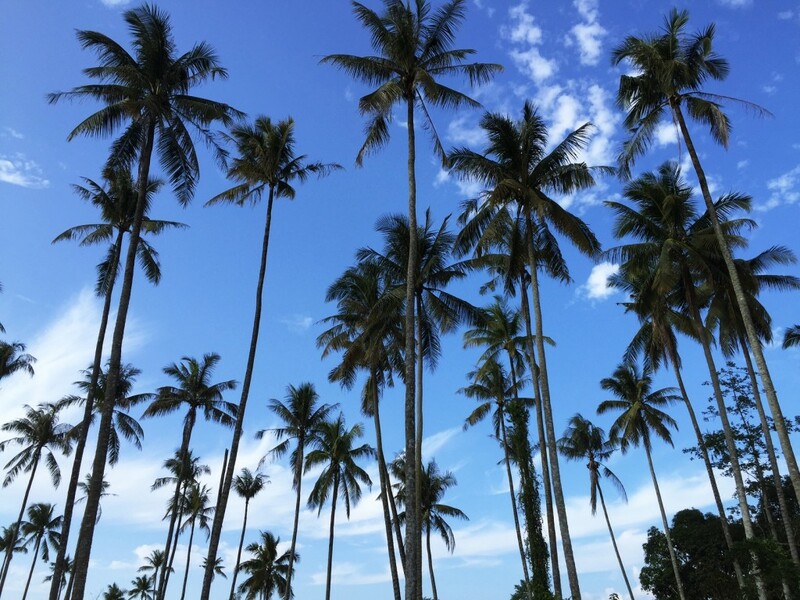 Beautiful white sandy beaches, crystal clear waters and an endless supply of fresh coconuts. As with all holidays, especially beach holidays, it isn’t quite complete without some pampering. I visited Mandara Spa at Sutera Harbour Resort, a beautiful spa with sweeping views of the South China Sea. 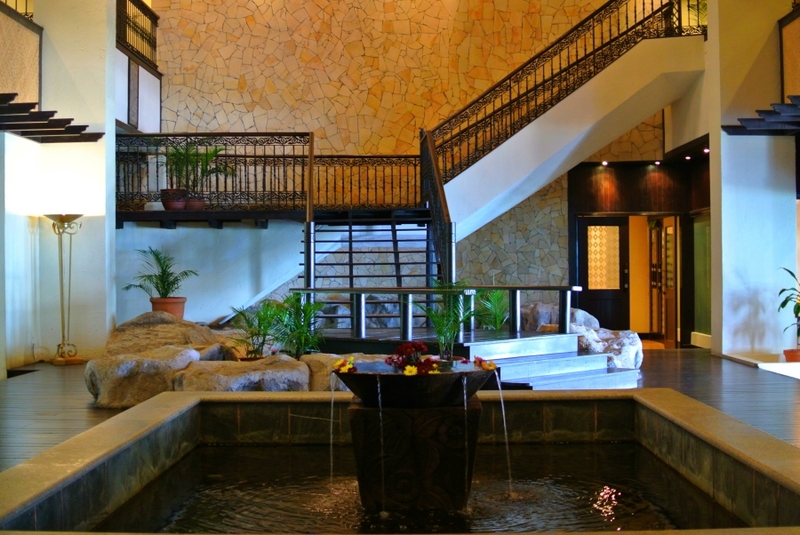 The spa’s lobby opens up to an airy lounge with cascading water pools and a spiral stairway leading up to individual spa suites. The wooden interior immediately brings on a cosy feeling. Warm ginger tea was served with a cold face towel scented with peppermint oil. A refreshing start to my pampering session. 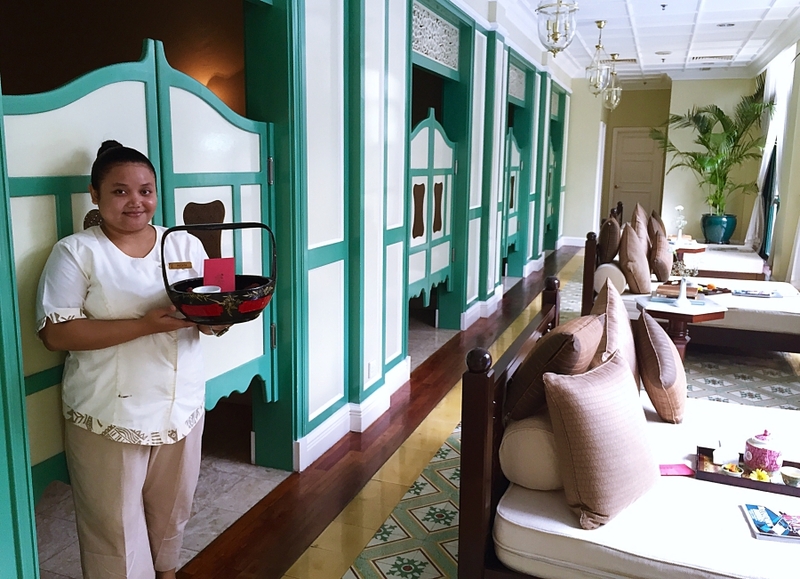 The spa’s signature massage is the Mandara Massage, four-hand massage. Despite being a spa addict, this was my first time having 20 fingers on my body at the same time. The four-hand massage is akin to ballroom dancing, if I may say. It requires a great deal of teamwork and practice. Both therapists massaged me with oil from my back to my feet with smooth and deep motions that are perfectly synchronised. I was quite amazed at how in-synced they were. The pressure was equal, the circular motions and long strokes were flawlessly choreographed. After doing my back, I was asked to turn over and then with the same technique, I was given the best head and foot massage. To have one highly-skilled therapist massaging my body is bliss, but to have two therapists doing so at the same time is extraordinarily special. The rainforest sounds continue to fill the air and I sip on a glass of water signaling the end of the session. I stare out the huge window overlooking the expansive seas with boats bobbing and thought – I can definitely stay here for hours – especially since the spa suite had a wonderful tub offering the grand view. The pampering wasn’t quite over yet, I was ushered to the neighbouring Chavana Spa at the Pacific Sutera Hotel, the alternative mid-range stay with magnificent views of the sea and a huge family-friendly pool. Chavana’s bright and lively interior is quite different from Mandara. This day-spa is refreshing the moment you enter in with scents of lime and lemongrass infiltrating the air. Another first for me – I was about to indulge in their Elemis Pro-Collagen Quartz Lift Facial, an anti-wrinkle facial using Elemis products. The British brand, Elemis is widely known as the leader in anti-ageing skin care products. 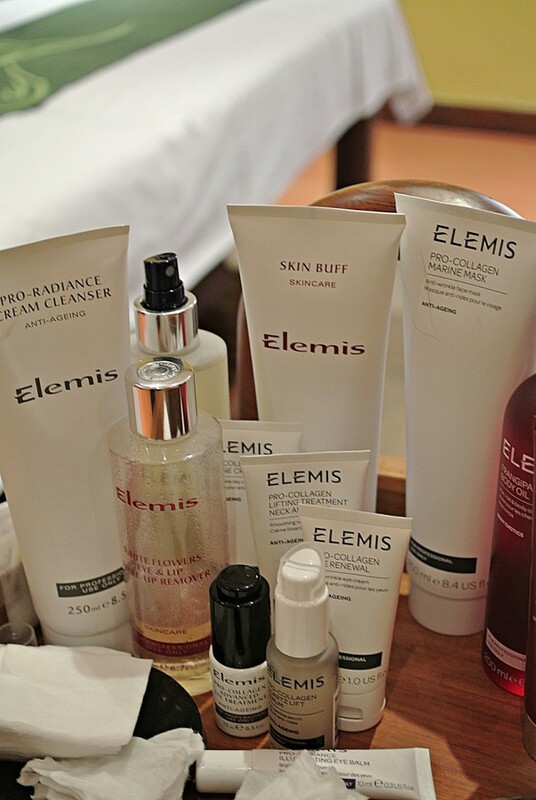 Top worldwide spas use Elemis products because of its successive positive case studies. So I thought, why not give it a try! When it comes to beauty regimes, I’m very low maintenance. I enjoy the occasional facial but am mostly content with off-the-shelf products, cucumbers for puffy eyes and homemade scrubs. For an hour and fifteen minutes, I was treated to delicate cleaning, cleansing and scrubbing with soothing movements on my forehead, cheeks and jawline. The lifting facial massage was most relaxing. Finally, a thin layer of mask was applied and then some serum, moisturiser with some essential oils completed the treatment. In between, my therapists gave me a relaxing shoulder and hand massage removing all the knots on my tense shoulders, often caused by bad posture and sitting at the desk for extended hours. The Chavana Spa offers a range head-to-tow treatments for tired travellers, honeymooners or spa spa addicts like me. Their signature ‘Journey of the Senses’ is a two and a half hour session starting with a foot bath, body scrub, detox sauna, balinese massage and capping it off with an Elemis facial. 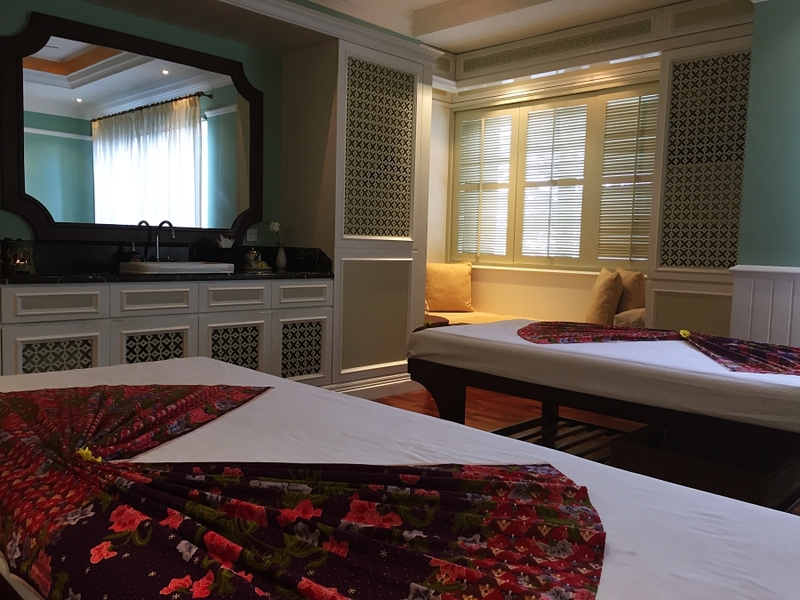 * Mandara Spa membership: For RM399 the package includes 2 complimentary massages, 1 complimentary facial, a 50% discount voucher and a RM75 redemption voucher. Additionally, you receive a 20% discount on all treatments and other discounts throughout the year especially for spa members. Go to Mandara Spa for more details. Note: The above treatment was offered to me complimentary courtesy of Mandara Spa and Chavana Spa. Thank you for a day of pampering! As the sun peaks over the horizon and the mighty Kinabatangan river catches the first rays of sunlight, my three-year old son, Seth keeps his gaze steady scanning the river banks in a hunt to find the herd of Pygmy elephants that were last spotted a day ago grazing at the river banks. Our guide and spotter Jamil knew how much Seth wanted to see elephants and readily agreed to the elephant spotting hunt when we set off from Sukau Rainforest Lodge just before dawn that morning. The mist lifted from the face of the river and the riverine forest came to live. Egrets took flight in the air and the colourful stork-billed kingfisher awoke for a catch. The forest echoed a symphony of tunes from the low hum of the cicadas to the chatter of playful macaques. Then, we spotted the majestic hornbill flying overtop before perching on a faraway tree. Truly, this was the best wildlife playground for any three-year old – especially, for Seth who is crazy over animals! 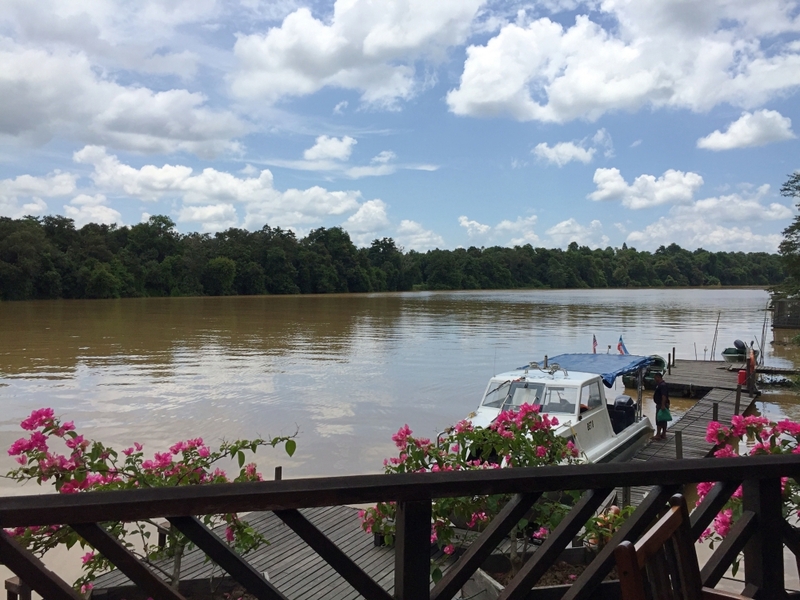 The mighty Kinabatangan river stretches 560kms, starting from the Crocker Range in southwest Sabah and ending at the Sulu Sea southeast of Sandakan. 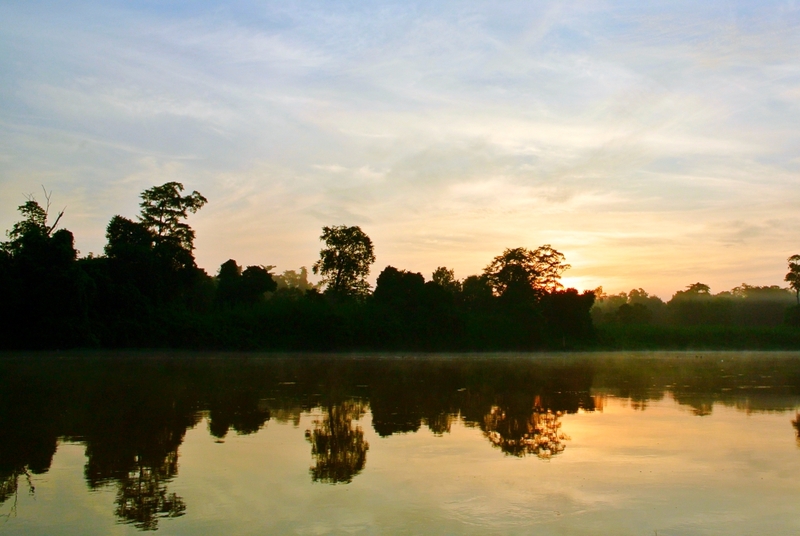 It is the longest river in Sabah and is incredibly rich in biodiversity. 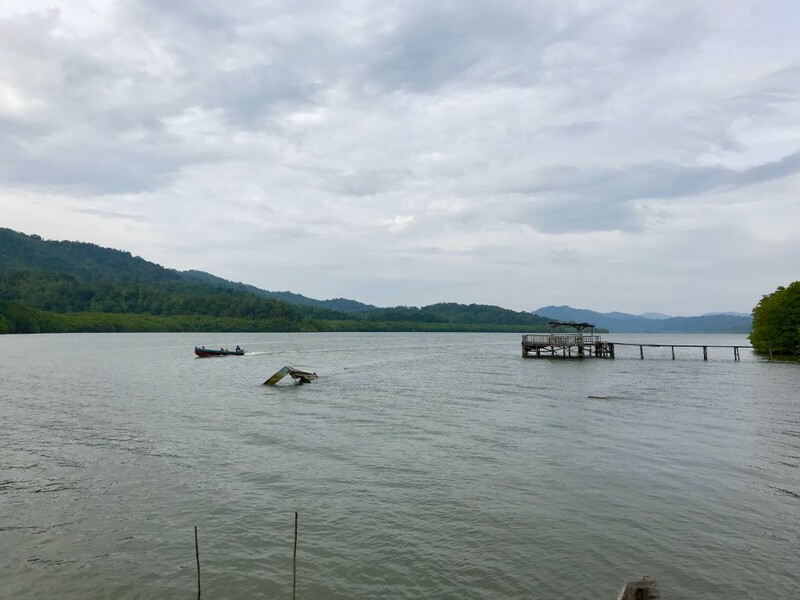 It is perhaps the most sought after destination in Sabah to spot wildlife – more notably the Borneo Big 5; the orang utan, Pygmy elephant, proboscis monkey, crocodile, and hornbill. The best way to enjoy the river and her wild inhabitants is by boat. Every morning and evening we set out on safari trips in groups no bigger than 10 people. Small vessels with very quiet electric motors were used to explore the river as we snake into narrow waterways and into mangrove forests. We had cameras and binoculars ready at all times. 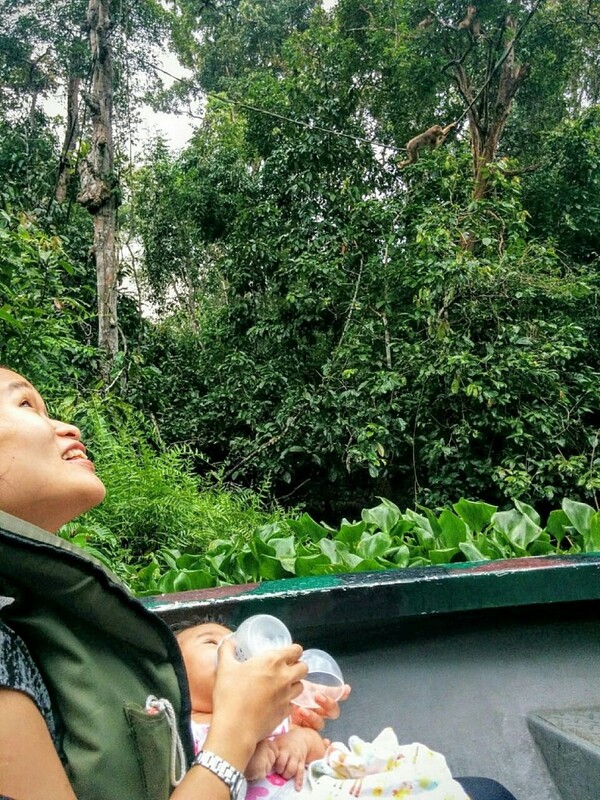 Our guide and boatman with laser-sharp eyes pointed to a dark speck on the big tree and through the binoculars, we saw a wild orang utan having his morning snack. Another time, our guide steadied the boat and pointed to the glistening eyes of a small crocodile. I caught a glimpse of it before it swiftly disappeared into the water. Traveling with a three-year old toddler and a three-month old baby was an adventure on its own. One time while on an evening safari, we felt a light drizzle starting. Within minutes, the drizzle turned into light showers and I found myself hiding under a raincoat with Seth at my side and Enya, my three-month old on my lap hiding from the rain. 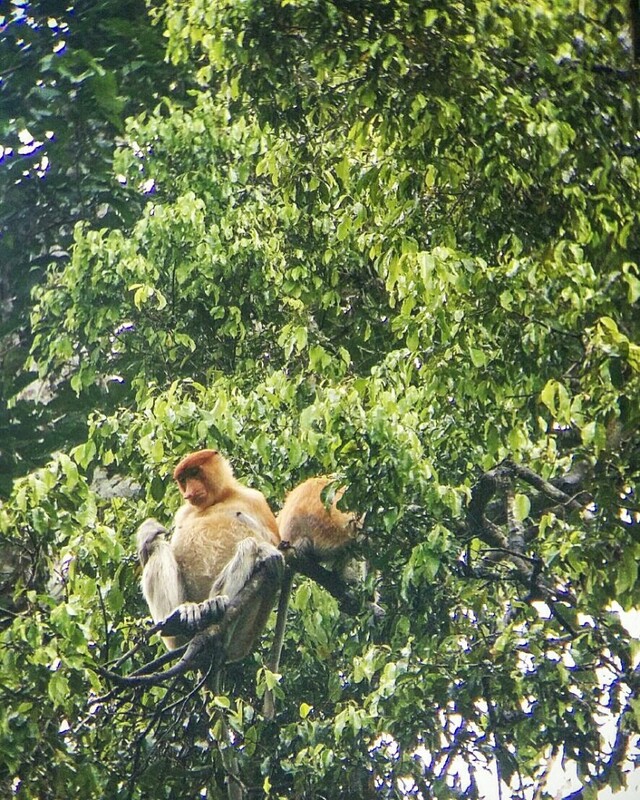 We waited patiently for the rain to pass and soon after we were rewarded with a scene of swinging proboscis monkeys and long-tail macaques who came out to play after the shower. 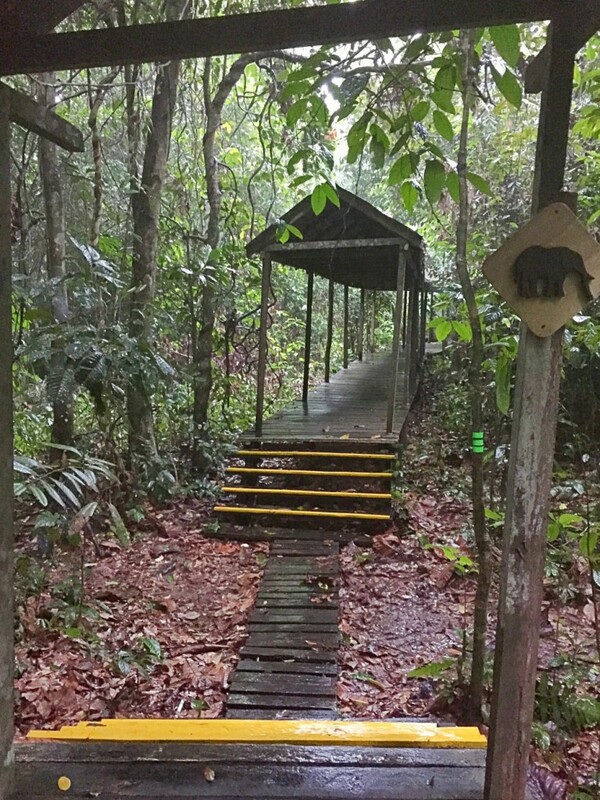 Back at the lodge, we explored the jungle by foot on the 1,500 feet boardwalk in search of insects and small mammals. 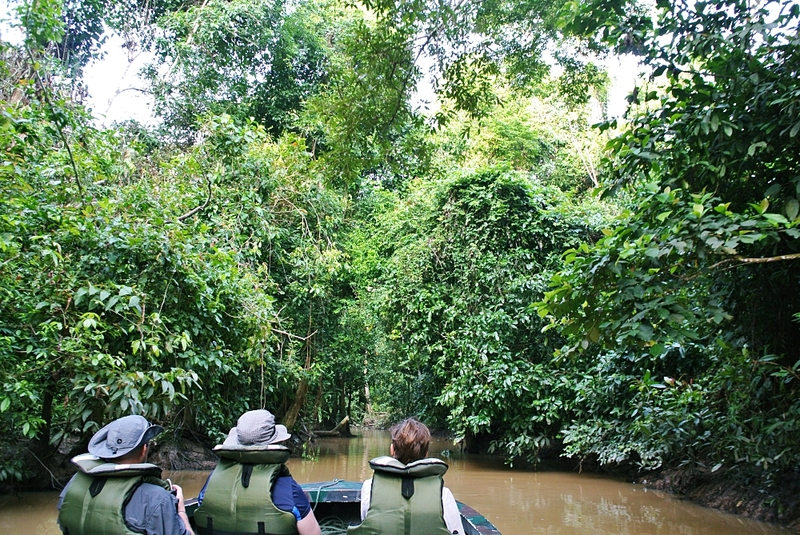 We waited for the resident orang utans to make an appearance and to our delight, we sighted two different orang utans during our stay. Our meals were served on an al fresco deck overlooking the river. It was also where new friendships were made as we exchanged notes with other guests on the day’s findings. In the dark of the night, after dinner, adventurous guests were given the option to go on another safari treat. It was too good to pass and Seth was eager as ever for another wildlife spotting hunt. The gentle motor boat sputtered on the shadowy river and our boatman scanned the jungle with his spotlight. We saw a kingfisher, a green paddy frog and a family of proboscis monkeys retired for the night. Yet, the most spectacular sight was when the boat came to a halt and the jungle stood still. The star-studded skies twinkled above as we trace our fingers across the milky way. I looked down and little Enya was fast asleep, lulled by the peaceful harmony of nature and the gentle rocking of the boat. After three days and two nights in this beautiful riverine jungle, we found it hard to say goodbye. Seth turned me as we were just about to leave and said, “Mom, I don’t want to go home. Can I stay?” There was good reason to stay as we did not see the elephants. In my effort to convince him, I told him – we will be back next time and hopefully, we will be able to see the mighty beast. Treat yourself to a fine holiday at Sukau Rainforest Lodge, a member of the National Geographic Unique Lodges of the World. 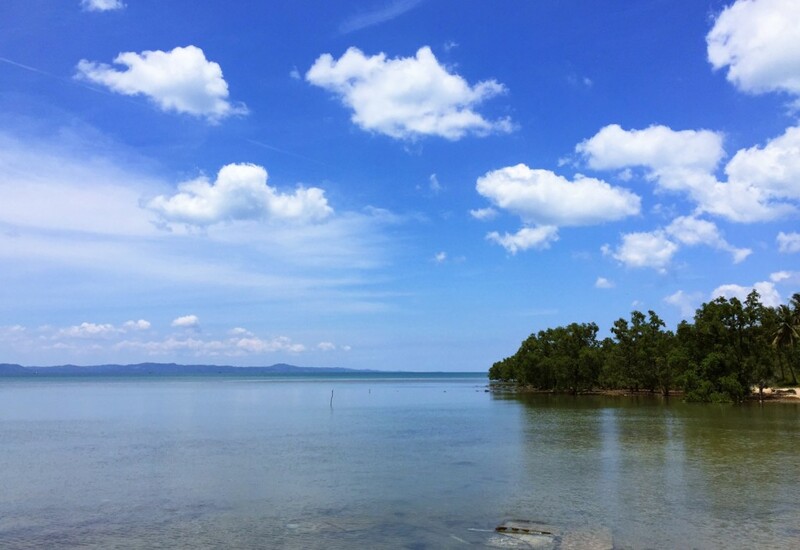 Fly into Sandakan airport and you will be transferred to the jetty where you will take a two-hour boat ride to the Kinabatangan River. This boat ride is a prelude to the adventure that awaits you. Wildlife spotting starts the minute you reach the river mouth. 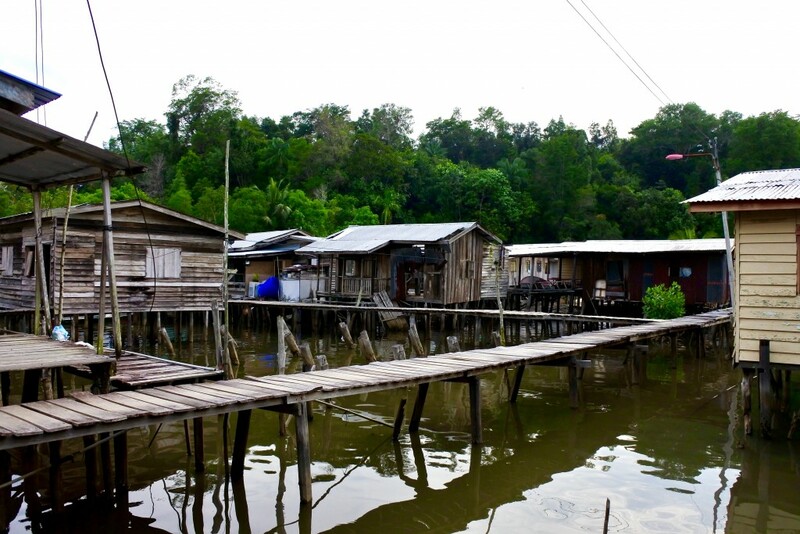 You will pass through small village settlements, oil palm plantations, mangrove and palm forests. The sight of proboscis monkeys is almost a guarantee. In Malacca, the early Chinese community that settled in Malaya in the early 17th century were known as Peranakans or Baba (male) and Nyonya (female). They were mostly traders, merchants or businessmen and were extremely successful, wealthy and influential. 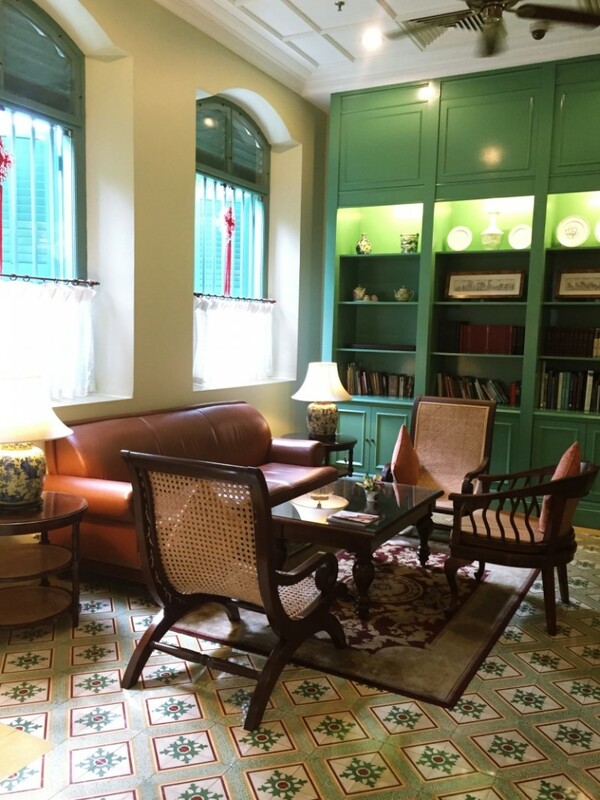 The Majestic Malacca was once a mansion owned by a Peranakan businessman and today, it has been restored to its former glory into The Majestic Malacca with an in-house luxurious spa, also known to be the only one to base its therapies around the healing culture of the Peranakan people. My three-hour pampering session began at the front desk where I filled out a questionnaire to determine the kind of treatment I needed; warm treatment for cooler body types and cold treatment for warmer body types. 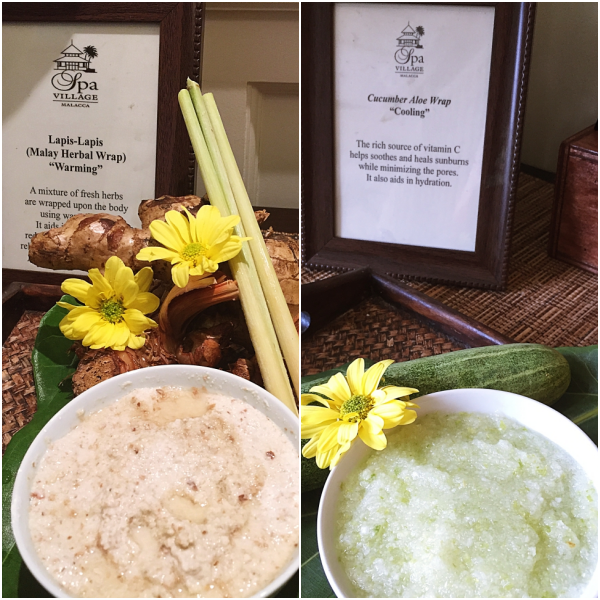 The range of treatments offered celebrates the incredible mix of Chinese and Malay ingredients that are often found in the Nyonya pantry but have been transformed to form a decadent concoction of spa treatments – ingredients such as eggs, palm sugar, ginger, birds nest, pandan, nutmeg and limau kasturi. After completing the questionnaire, I was whisked into a private changing room and asked to change into a plush robe. 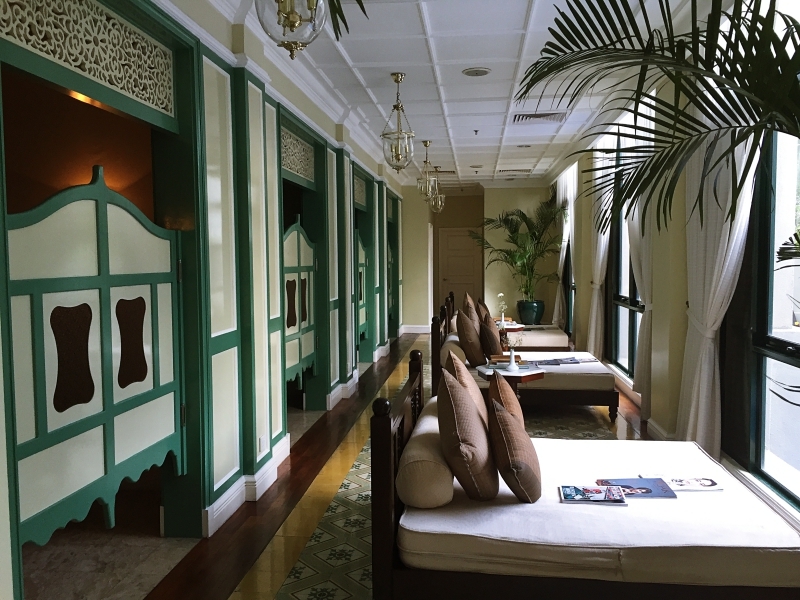 Then I was taken to an airy lounge with spacious Peranakan day beds overlooking the glistening lap pool. Purveyed with cold scented towels, hot Chinese tea and a Mandarin orange, my mind began to wander as my body started relaxing. My treatment started soon after as I followed my masseur, Redita upstairs into my private massage suite. Designed to please the eye, the wooden shuttered windows are drawn shut with the slightest hint of sun streaming in accenting the soothing light teal and creme colours of the wall. 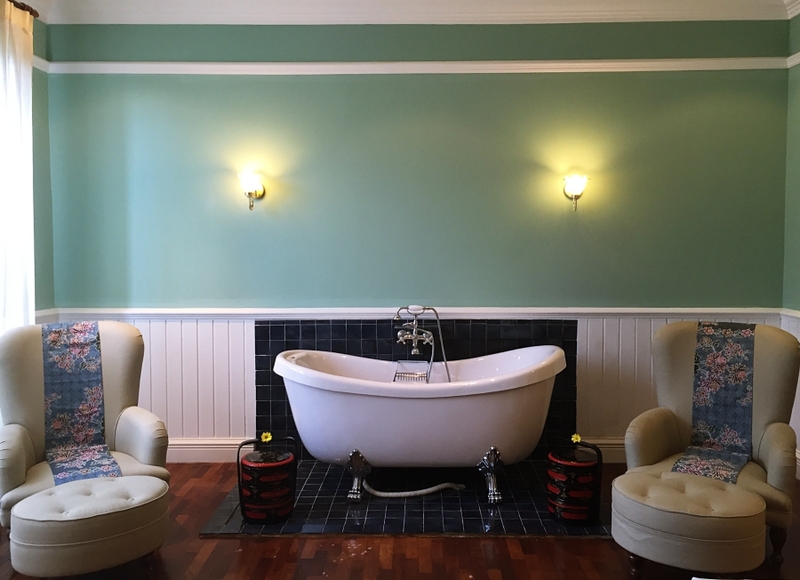 Two massage beds sat island in the room and the suite has its own toilet, shower and standalone clawfoot bath tub. Bliss began as my face was treated with to an exotic birds nest facial. Birds nest, a Chinese prized ingredient is lauded for its healing properties that are thought to boost immunity and bolster longevity. Jade rollers were used at the end of the massage to close the pores and tighten facial muscles. Almost lulled to sleep, my senses came to life as scents of sweet pandan infused the room. I was given a firm head massage before my hair was treated to a thick sweet coconut-pandan hair mask. The aroma almost made me salivate and crave for some good local dessert and I my mind drifted into pure bliss. Since I am pregnant, Redita proceeded to give me a pregnancy massage. Laying on my side, she massaged my back and shoulders giving utmost care to ensure my comfort. Her movements were seamless, with long firm strokes expelling all the knots on my stiff shoulders. She was also mindful not to massage my feet and kept the pressure light when massaging my lower back. Just as I thought my treatment was over, I was treated with a special hair washing treatment, drawing on the twelve step Peranakan wedding preparation for brides. On each of twelve days leading up to the marriage ceremony, Nyonya brides are traditionally pampered and beautified which involves a different ritual every day. The hair washing ceremony ends with a hair combing ritual believed to eliminate impurities and negativity as the bride steps into a new chapter of life. 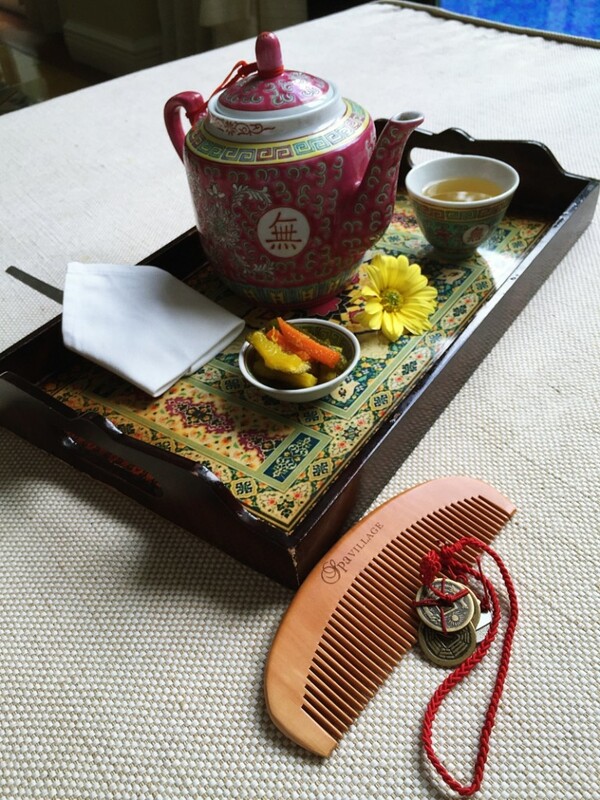 After an ultimate three-hour pampering, I sank into the sprawling Chinese day bed and sipped on pot of soothing Chinese tea while savouring on some acar, pickled vegetables and wishfully hoped that the minutes stood still. Every building has a story, particularly heritage buildings that have weathered the storms and survived to bear the footprints of this generation. 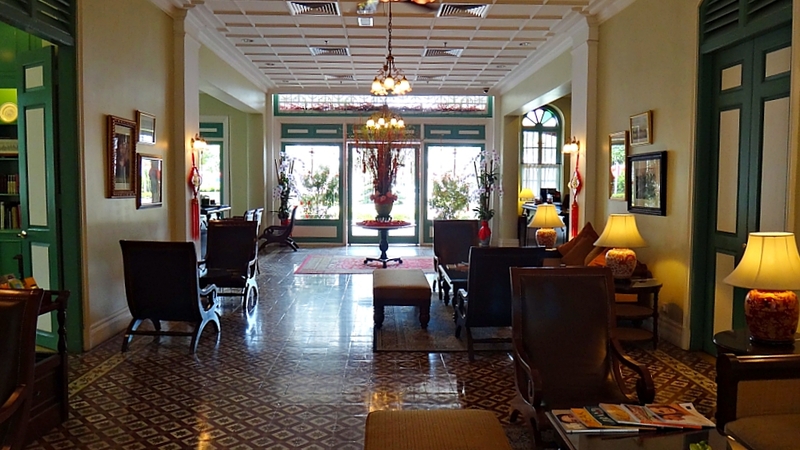 I entered the modest lobby of the Majestic Malacca and felt perfectly at home. The warm lighting from the porcelain umbrella lamps and the old-fashioned chandelier set the place aglow. Large leather-bound armchairs and wicker furniture beckoned me for a rest. 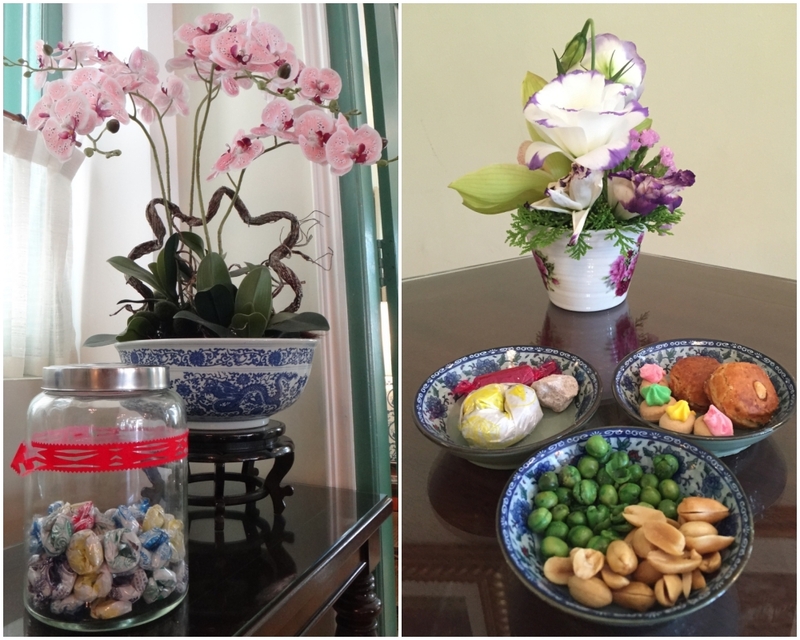 As I looked around, I found a few glass containers filled with familiar childhood goodies – preserved sweet plums, peanut biscuits, tou chee phaeng – tiny plain biscuits topped with a swirl of colourful harden icing sugar (in English, it’s translated as belly button biscuits), green peas, salted peanuts and coconut candy. These munchies brought back many memories and are reminiscent of Malacca’s rich culinary heritage – especially the coconut candy that taste almost like Gula Melaka. The beautiful Spanish tiles and solid timber staircase, reception and bar counter evoke an air of opulence in the days of past. I learned that this building was once a mansion belonging to a wealthy rubber tycoon who had four wives and he lavishly designed his home with the best fittings and furnishings. 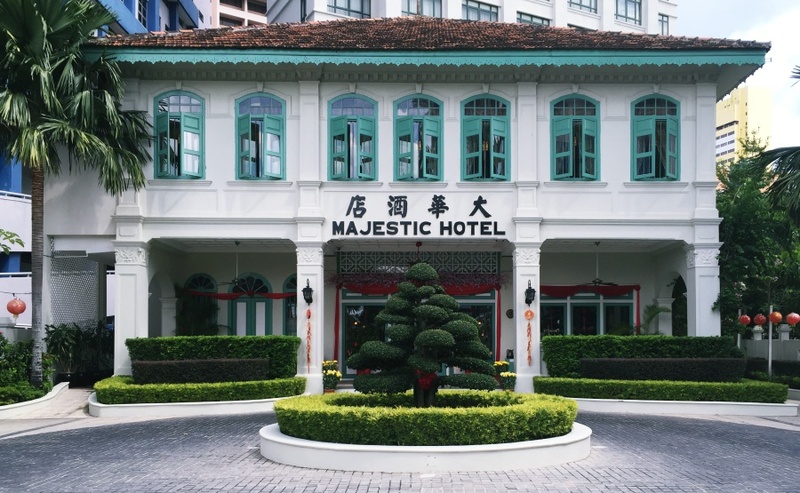 The decadence continued even after he passed on when a hotelier bought over the mansion and transformed it into a hotel bearing the same name “Majestic”. The reception and bar counters have been kept intact since the 1920s. The Majestic played host to traveling merchants and British planters. It was then lauded for its grandiosity where big banquets and important meetings were held within its walls. But its glory soon faded and was converted into a simple guesthouse and soon after abandoned. 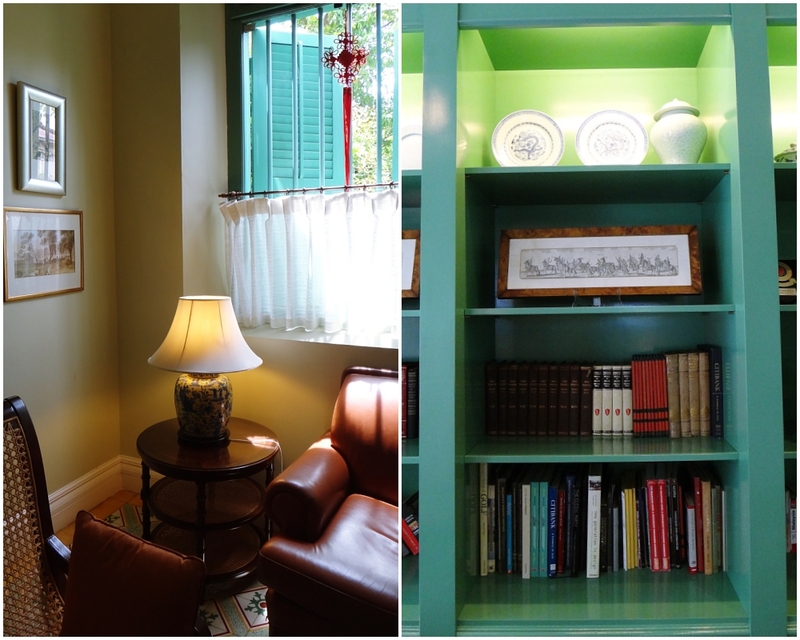 Walking into the Library, a lounge and lunch area with a floor to ceiling bookshelf filled with historical reads, I get a sense that the mansion was painstakingly and delicately restored to keep its charm and history unflawed. The cosy Library with its large wooden shuttered windows with warm natural light streaming in and soft arm chairs makes for a cozy curl up and read. This space was formerly a bedroom space which now has been aptly converted into a relaxing lounge where lunch and tea is served. 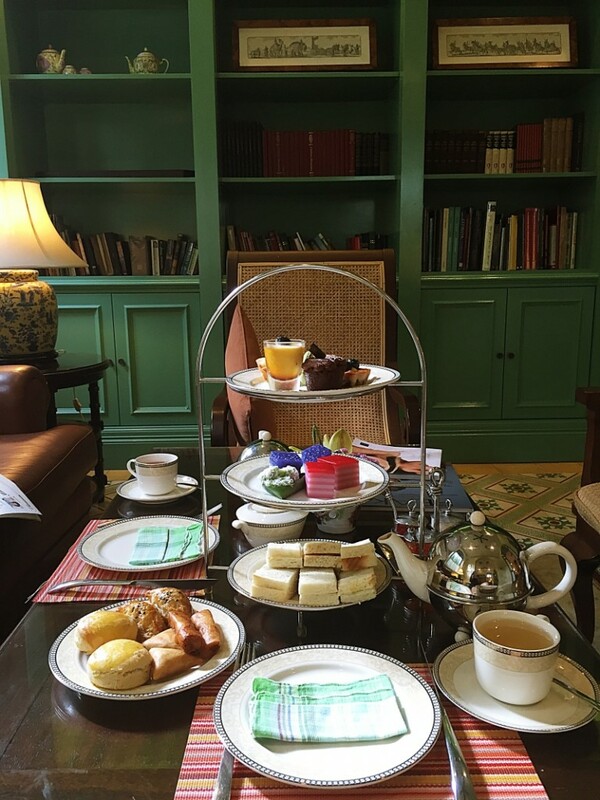 I spent an afternoon sipping on green tea and nibbling on fine local and European tea snacks served on a three-tier platter – scones with clotted cream and jam, creme brulee, cheese tarts, macarons, finger sandwiches, kuih lapis, blue glutinous rice cakes, ondeh-ondeh, spring rolls and samosas. Full and satisfied after tea, I settled in and buried my face into a book trying not to feel guilty for the calories I’ve piled on. But my conscience did not waver, so I visited the hotel’s gym and spent an hour sweating it out. The fully equipped gym is small, but has all the essential equipment for a good workout. Overlooking the gym is a lap pool and it connects to a tall building where all 54 guest rooms are housed. 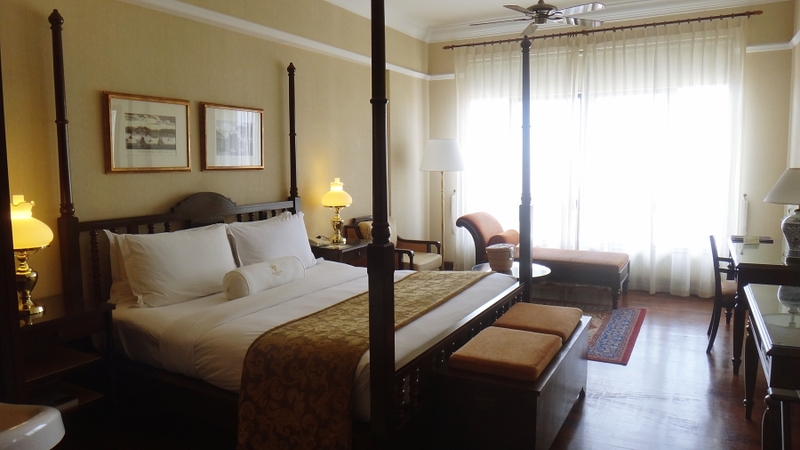 My room was just as homely as the lobby, elegantly designed in neo Asian-colonial style with timber floorings, a teakwood four-poster bed and a sprawling daybed overlooking the Malacca River. 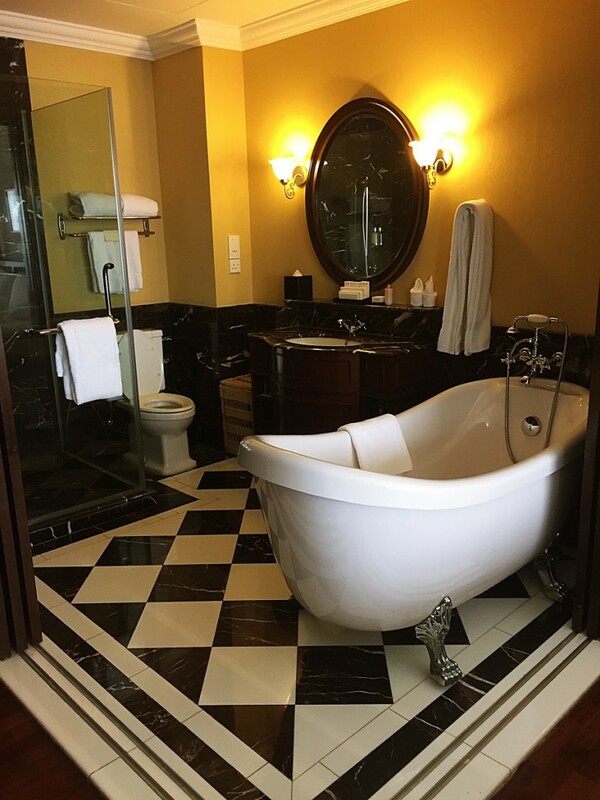 The open bathroom with wooden sliding doors offer a chic accent with black and white marble floor and a large clawfoot bathtub. Yet, even with the most luxuriate furnishings, what stood out was the warm, friendly hospitality of the people who work behind the scenes. 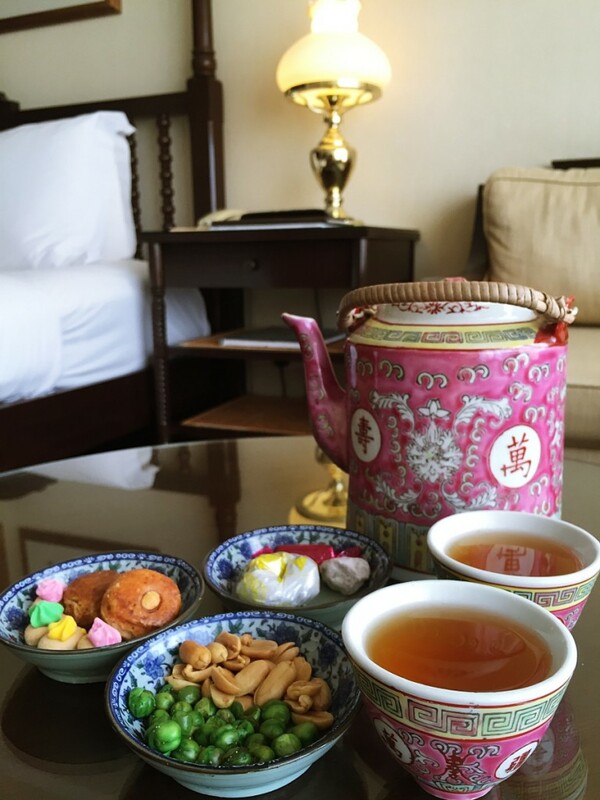 Upon check-in, a wicker basket with porcelain teacups and a teapot filled with soothing warm Chinese tea was served to me in my room. I later requested for some nibbles to munch on and it promptly delivered to my room without fuss. Dining at The Mansion just above the lobby area was pure delight. Tunes from the grand piano piped through the entire building filling it with a sense of nostalgia. 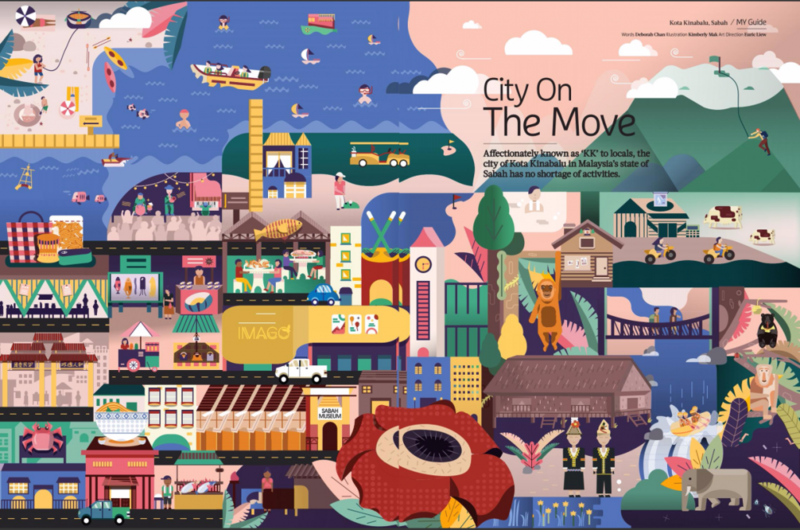 The spacious windows draped with elegant curtains boast views of the glistening Malacca River and Kampung Morten with dancing night lights as the city comes to life in the evening. The menu is simple and uncomplicated, it celebrates the best of Malacca cuisine; the perfect blend of Portuguese, Dutch, English and Baba-Nyonya cultures. 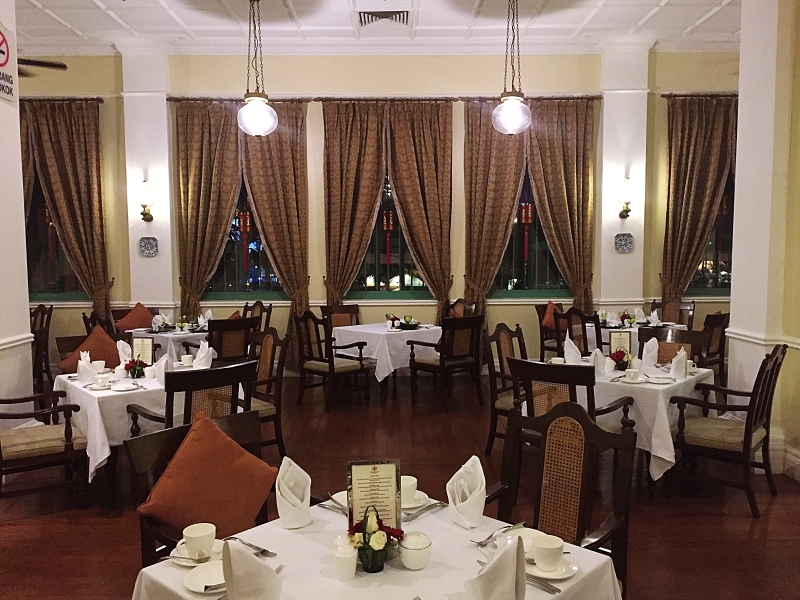 From the food, to the service, to the hotel’s fine furnishings – the Majestic Malacca triumphantly captured the opulence of its heyday. Not many hotels are successful in telling their story so well, still not many are able to preserve a history that spanned almost a century old and to this day dwell in its confines. 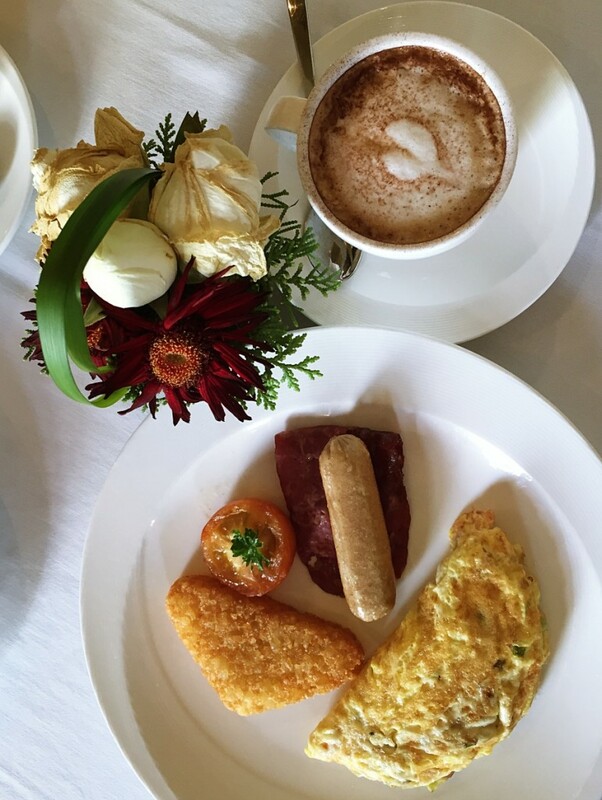 A visit to Malacca would be shortchanged if you did not stop by the Majestic for a stay or even stop over for a cup of Chinese tea.